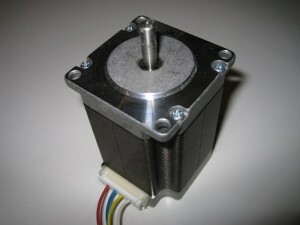 A standard bipolar stepper-motor usually will have 1.8 degree steps. That will be 200 steps per revolution. It has two motor windings (phase A and B) that must be controlled. The motor is rated at some maximum current per phase. That means, it will be the maximum current in each winding. Normally we can control this current with a resistor in serial with the phase or we can use PWM (Pulse with Modulation). 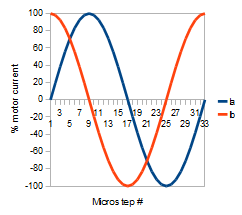 If we have 12V for our motor, it will have to be at about 50% duty cycle to meet the maximum rating. A standard full step cycle consist of 4 steps. Thesesteps must the be repeated over and over again, to make the motor turn. If we reverse the cycle the motor will turn in reverse. As we see from the table above, we will have to inverse the polarity of the phase voltage every other step. To do this we can use a standard H-bridge. With two H-bridges we can control the current in both phases. As we can se from the plots above, we will not be able to feed the proper amount of current for the motor at higher stepping-rates. 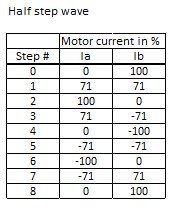 Eventually the stepper motor will stall and just stop at some point if we further increase the step rate. In the diagram above the first step will be the point at the upper right, step two will be at bottom right, step tree at bottom left and step four will be at the top left. 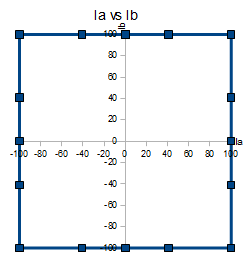 If we follow the steps from 1-4 the plots will go clockwise in the diagram. 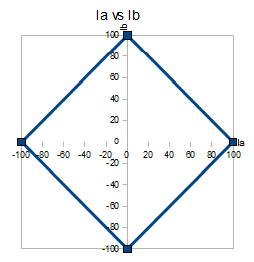 And the phase diagram will look like this. As we can see from the diagram above, we will have maximum torque possible for each micro step. But step number 1 have more torque than step 0, step 2 have more that step 1. 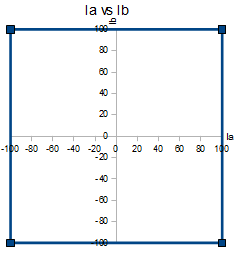 The highest torque is the steps in the corners in the phase diagram. 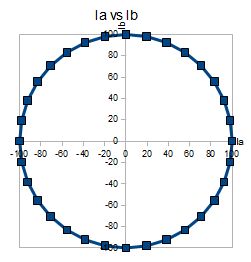 The torque is the length from center to the step-plot. This is because, if we energize both windings, the motor will have more torque than if we only energize one winding. This will cause the motor to rotate a bit choppy, and there will be some vibrations. To overcome this problem, it’s better to use wave-stepping. At the next table we see that only one phase is energized at a time. For full steps this method only decreases the torque, and does not really give any benefits. 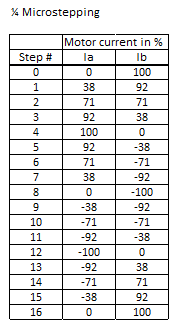 At 1/4 micro-stepping we will just increase the resolution of the current table. The driver electronics will have to control the current according to the table for each micro-step. At 1/8 micro-stepping we will se that the current in each phase is actually a SIN and a COS. Each phase is 90 degree from each other. I would like to know how have you varied the phase of the two PWM signals? I can understand the phase difference is 90 deg. How it could be possible to generate such PWM signals 90 deg out of phase with each other in a Microcontrollers? Its all generated by ‘direct digital synthesis’ – you start with the phase angle, look up the output value in a wave table (here sine/cosine curve) and output that. 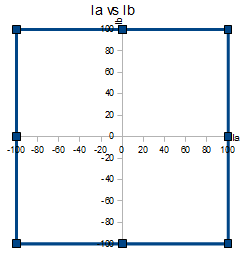 For the other phase just offset it by 90 degrees. Each step increments (or decrements) both phases by the step phase angle… A few additions and a table lookup, very easy at these frequencies. This technique can be used at much high frequencies too with dedicated high-speed CMOS hardware, such as generating RF signals at 100’s of MHz. Great explanation. Thanks! 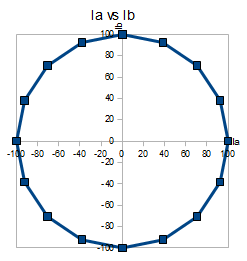 And I finally got introduced in a practical way to sine calculations. Since I’m missing some basics in that field this is highly interesting. 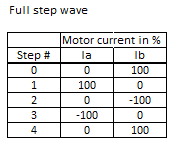 I have got the full and half stepping implementing on my stepper motor successfully but not able to program for the microstepping.I saw this tutorial but how to program for the microstepping. Can you give me any sample code as a reference for the microstepping? What is the frequency for the PWM ? Normally I would have a PWM above what humans can hear, so from 20kHz and up. Else you canr hear the humming from the motor. 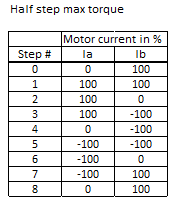 Please tell me how to implement micro stepping stepper motor using PIC microcontroller and H-bridge driver IC. Hi. You’ll need two H-bridges that you can control the current from the PIC. Then you program the PIC to deliver different amount of current to each windings of the motor for each microstep. 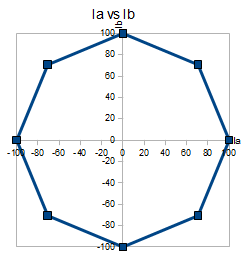 I guess you meant to comment on the Lamjastep-schematic. THx and THx_INV is just some labels, and is the Trigger High or Trigger Low signals. They determine how the decay for the PWM works. If THx (inverse of THx_INV) is on, the current error is so much that the current should reverse. if TL is on,its so low that it should reverse. In between, the H-bridge is just freewheeling. 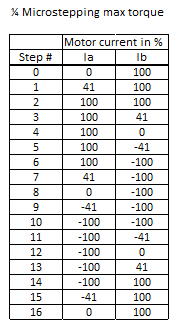 DMx jumper (Decay Mode) is used to disable the freewheeling part. DMx off = “Mixed kind of decay”, and on = “Fast decay”.